I was in Salthill on Sunday and by chance I had my running gear in the car so took a jog around Salthill as the day was lovely. Its amazing how rusty you get after a short space of time of no running, so 4.1 miles was tough at best the last day, but struggled along regardless. I always enjoy Salthill though, apart from the fact it's the spot of my greatest running moment (completing the half marathon last year), it also is very relaxing with the views of the sea. The only thing now is to get the distance back in my legs and hopefully back up into the 10+ miles as soon as possible. As much as I'd like to say I'm going to do the Duathlon this month, it just won't happen without proper training, its simply an event that if it's disrespected it will make you miserable when you do it. However the plan for the moment is to get into training to do the Great Ireland Run 10k on April 15 in Dublin. I've decided that my first target this year should be to get my 10k PB time down and attempt to make some improvements on it. For this I am going to use the Hal Higdon 10k Intermediate Plan with hopes that my speed will improve. I took to doing my first 3 mile run yesterday for this plan and have to say I found it tough, although my choice of route did not help as it consisted mainly of sharp inclines and drops, not the ideal way to begin a training plan but worked through it none the less. A nice 30 minute run to get started, not exactly blistering pace, but at least its a start. Have hit the gym now as well to do some core work, so hopefully this will aid me on my way towards improving my times. Despite all my best intentions, i've only managed to sneak in two more runs since my last post on my blog. Alas between work, taking language classes and general tiredness, my motivation has taken a serious blow and just don't feel the enthusiasm I had last year. I wonder if its down to just training solo or what is it, but need to get back into it. "The one with the Duathlon, Half Marathon and the Adventure Race"
Right I'm back again after 6 weeks of pretty much eating, drinking and pretty much giving my body a kicking, and as the title suggests this year should be 3 resolutions I'd like to get done. No. 1 - Complete a duathlon, have eyed the Conamara Duathlon on the 25th February as a target - simply because it is 5 minutes down the road from me and would love to give it a crack. No. 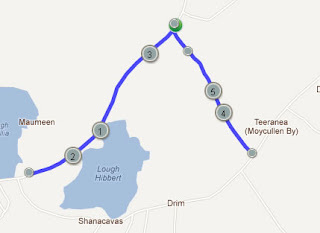 2 - Complete my sub-2 half marathon, its a modest target I know, but am still a bit bugged about my 2:02 last year in the Galway Bay Half Marathon, and would love to just get that out of the way. I haven't settled yet on which half marathon to do though so that will have to wait and see. No. 3 - Complete an adventure race, am considering the Sea2Summit, whether its the short or long course yet, am not sure. So that's the plan, am starting by jumping into a beginners duathlon plan at Week 2 tomorrow in hopes that i'll be ready for the 25th February. Considering my cycling experience is very limited, am not quite sure what I'm letting myself in for, so let us see what happens. All help, rambling, criticism, praise etc greatly appreciated again this year folks.